Two crowd favorites come together in this unique recipe for Tex-Mex Fajita Pizza, a delicious south-of-the-border addition to your football menu. Mexican flavors on pizza have reached proliferation on restaurant menus and can be found mostly at casual and quick service chain restaurants. TABASCO® brand Original Red Sauce --- 3 oz. TABASCO® brand Green Jalapeño Pepper Sauce --- 1 oz. White onion --- 1 ea. Yellow bell pepper --- 1 ea. Red bell pepper --- 1 ea. Green bell pepper --- 1 ea. Red onion, shaved --- 1 ea. Thin-crust pizza shell, 12-in. diameter --- 1 ea. Lime, juice only --- 1 ea. Confetti-dice white onion and bell peppers; mix together. Combine with shaved red onion. 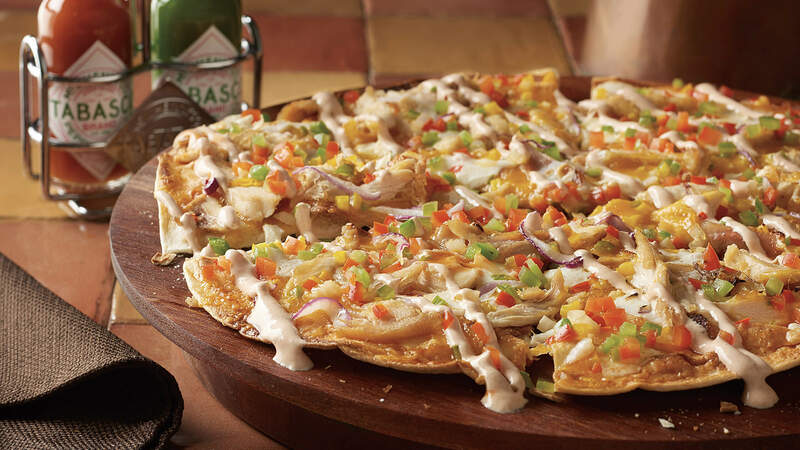 Mix together enchilada sauce and TABASCO® Sauce, spread over pizza shell, and lay sliced chicken over top. Combine all cheeses; spread one-third to one-half over top of pizza. Generously sprinkle diced peppers over cheese, then cover with another layer of cheese. Bake in a 375º oven until golden brown. While baking, combine TABASCO® Green Sauce, sour cream and lime juice; drizzle over the finished pizza. Cost Per Serving* $4.11 Total Profit $--.-- *Based on FDA average pricing for ingredients.